I am pleased to be hosting a game day party today. I must admit that we are not huge football fans in this household. That not withstanding, I love hosting game day parties. At our house the game is on in the background and the main focus is on the food, drink and the card games or board games that we enjoy while glancing at the screen every once in a while. 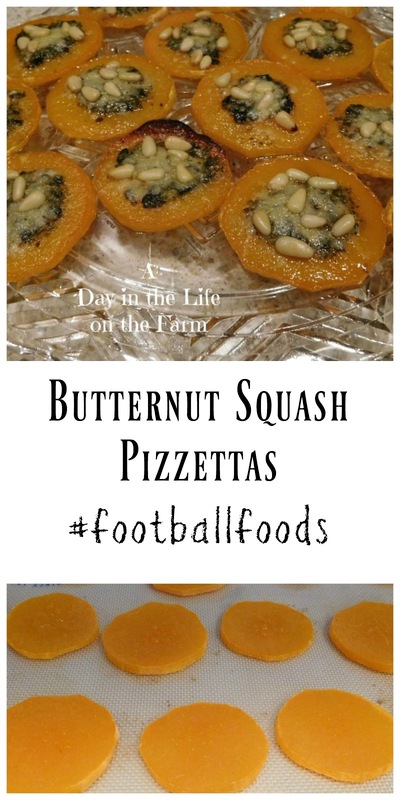 Being as it is the start of a New Year and many of us resolve to try to eat more healthily, I was thrilled to open up a flyer from my local grocer and find this recipe for Butternut Squash Pizzettas. While these taste absolutely nothing like pizza, they are adorable and crazily delicious. They are a great finger food and make a great addition to the often calorie laden fare normally found at game day parties. Include these at your next gathering and watch the pleasure on your guests faces when they realize they can enjoy something other than the carrot and celery sticks on the snack table. I made these in two steps, roasting the butternut squash earlier in the day and then topping the rounds and putting them in the oven shortly before my guests were to arrive. Cut the stem and bulb from a butternut squash. Discard the stem and reserve the bulb to be peeled, seeded and used in another application. Peel the neck and slice into 1/4" rounds. Place onto a baking sheet that has been lined with a silicone mat or parchment paper. Bake in a preheated 400* oven for 15 minutes, flip rounds over and bake for another 15-20 minutes, until tender. Remove from oven. Top each round with pesto and then sprinkle with cheese. Divide the pine nuts between the rounds and return to the oven for about 5 minutes, until cheese is melted and bubbly. I loved them Jolene, I hope you do too. What a great idea! I love squash and these look like a super fun way to eat it! Thanks Carlee, they were pretty delicious. So glad to find something healthy for game day! These look awesome. What a neat idea! Much better than carrots and celery! You have no idea how much I love butternut squash.. SO.. I can't wait to try this!!!! Pretty excited!!!! Thanks for sharing at our Celebrate 365 Football Party recipe Round up!